Although most houses have central heating these days, that doesn’t mean that fireplaces are obsolete. Fireplaces do more than just heat a room (although they’re also quite good at that!). They give a room a focal point, add elegance, and can significantly increase the value of a home, depending on your market. There’s also sentimental value, as fireplaces give family and friends an area to gather when the weather turns colder. If you just happen to have a lot of money burning a hole in your pocket, there’s no end to the ornate and elaborate fireplaces you can buy for your home. Let’s take a look at a few of the most expensive options out there. G5000 (Cal Flame) Cost: $6,900 Have you ever found yourself saying, “I need both a fireplace and an outdoor cocktail table?” Well, you’re in luck with the Cal Flame G5000, a fire pit that doubles as a place to share a meal and drinks with friends. The circular table is made of industrial grade glass and the fire pit is in the center, bringing a whole new meaning to the idea of gathering around the fire. Gate Wood Burning Fireplace (Conmoto) Cost: $7,640 Although we’ll see a lot of modern and post-modern designs on this list, there’s just something about a classic wood-burning fireplace that engages all the senses and brings on waves of nostalgia. In this fireplace, Conmoto combines modernity and tradition with its tall, stainless steel fireplace. The glass front of this fireplace gives you a great view of the flame, and the unit even comes with a sleek log storage unit. Gold Fireplace (Wodtke) Cost: $7,929 $8,000 might seem like a lot for a fireplace, but maybe it’s not so outrageous when you consider that this fireplace is covered with real gold leaf. 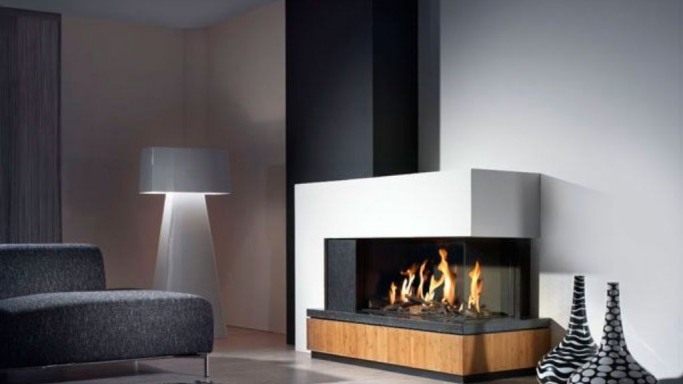 German manufacturer Wodtke designed this fireplace to be both eco-friendly and elegant. It is tall and narrow, with an LED module inside its frame. If you’re worried about the fireplace matching with the rest of your room, you can choose from several different finishes. Because it is narrow and lightweight, it can easily be moved to different places, so you can set up your fireplace up anywhere from the living room to the garden. Solaris See-Through Glass Fireplace (Heat & Glo) Cost: $11,999 This design is perfect for anyone who likes a more futuristic aesthetic… and has a cool $12,000 that they’re willing to lay down. What makes this unit stand out from the competition is that it is reportedly the world’s thinnest fireplace, so you don’t have to worry about taking up valuable space in your home. This fireplace, which looks somewhat like a shuttle portal in a sci-fi movie, can be mounted directly on a wall and uses specialized venting to ensure that it is safe. Boomerang Fireplace (EcoSmart Fire) Cost: $12,880 No, you can’t literally throw this fireplace and have it come back to you (technically we haven’t tried, so just call that an educated guess), but the curved, boomerang-shaped design is still pretty cool. The frame of this rather diminutive fireplace is made of timber, leather, and stainless steel, and the flame is contained by glass panels. The fireplace also comes on a swivel base, so you can move it to face different areas of the room. Swarovski Crystal Fireplace (Justen Ladda) Cost: $20,000 If you live in a house with elegant 19th century architecture, this could be the fireplace for you. The fireplace is primarily made from stainless steel, but it also has royal red curtains overlaid with Swarovski crystals. If you already have a fireplace in your house, Justen Ladda will custom design the Swarovski crystal curtains and steel opening to fit with your existing model. Multi-Media Fireplace (Vok) Cost: $31,200 Sure, staring at the crackling flames in the hearth is entrancing, but what if your fireplace came with a TV? Better yet, what if it came not only with a TV, but with a DVD player, BOSE sound system, and internet connectivity? That’s exactly what you get if you purchase the multi-media fireplace from Vok, a company that’s determined to make sure that you never get cold when you’re watching your favorite shows and movies or staying up all night surfing the web. The Aqueon Fireplace (Heat & Glo) Cost: $50,000 Although some fireplace purists might turn up their nose at this design, the Aqueon fireplace is an environmentally-friendly breakthrough that doesn’t even require a chimney. Instead of burning wood, the fireplace harvests hydrogen from tap water to produce the open flame. Taking a somewhat metaphysical approach, the frame of the fireplace itself is designed in the shape of a flickering flame. This post provides by the fireplace experts at Northshore Fireplace. Connect with them on Google+ or visit their store location at 2813 Central Street, Evanston , Illinois 60201.